Last week Bruce Wayne discovered that criminals were worming their way into Wayne Enterprises, Maroni is making a power play against Falcone and the Penguin gave Maroni leverge against Gordon. This week it looks like Gotham is doing a weird Halloween themed episode with a really creepy villain of the week. Episode opens with a 10 year flashback sequence where we first meet Gotham’s very old boogy man “The Spirit of the Goat.” Bullock and his partner Dix confront the masked killer – who thinks he’s possessed by an evil spirit. Apparently this is one of the cases that changed Bullock to the person he is today. Bullock once again kills the suspect. Does this man ever NOT kill a suspect? Flash forward to present day, Bullock is at a crime scene that is an exact copy of the Goat’s M.O. Gordon isn’t at the Crime Scene, he’s busy having a fight with Barbara. Montoya and her partner (we don’t care who he is) question a homeless man who saw Gordon shoot Cobblepot. Seems the Goat kills the first born of Gotham’s 1 percent. Bullock is haunted by the first case and knows that the media will be on their butts if they don’t solve it quickly. Ed is investigating the murder on his own and being creepy as always as he hits on a clerk named Kristen Kringle. The writers really aren’t being subtle with their names. Oswald visits his mother. He tells his mother that all he wanted was a little respect and they all hurt him. He promised her that he would be somebody in this town. Bullock and Gordon found a coin in victim’s head. This was a detail that was never released to the public so Bullock is convinced that the real Goat must have somehow returned. Bullock and Gordon visit his ex partner Dix who tells him that the coin proves that they were wrong, there were more people involved. Bruce is fascinated by the Goat’s use of the mask. Alfred reminds him that he is the first born son of one of the wealthiest families in Gotham. He responds by telling Alfred that the Goat wouldn’t take him because there’s no one around who would miss him. Barbara begs Montoya to leave Gordon alone and she says the hammer is about to drop and it’s time for Barbara to get out of town until it blows over. 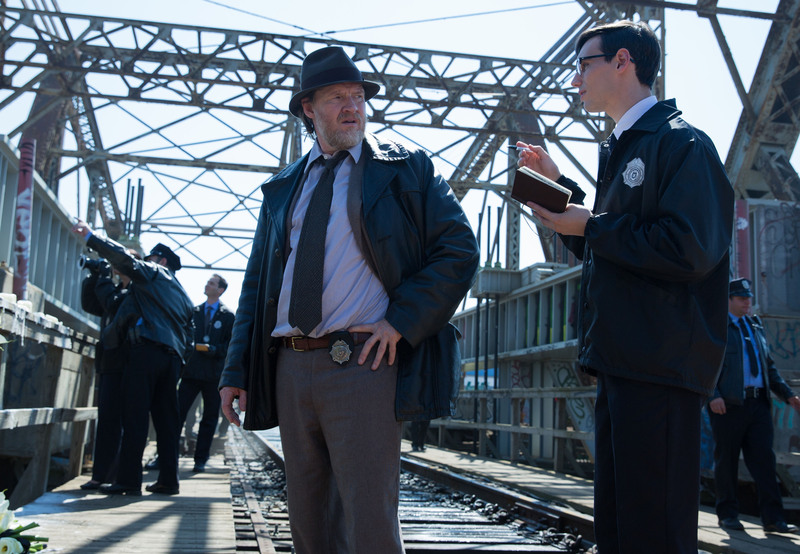 Clues lead Gordon and Bullock back to the warehouse where the original confrontation took place. Bullock does not like the Deja-Vu feeling. Wow, they finally catch someone alive! Cat breaks into Wayne Manor and sees Bruce asleep, there’s some weird attraction there. She sees Bruce’s crime wall, steals an item off the desk and sneaks back out. There’s a creepy moment where Oswald’s mother bathes him. He tells his mother that he found a police man that he actually trusts to help him come out right in the end. 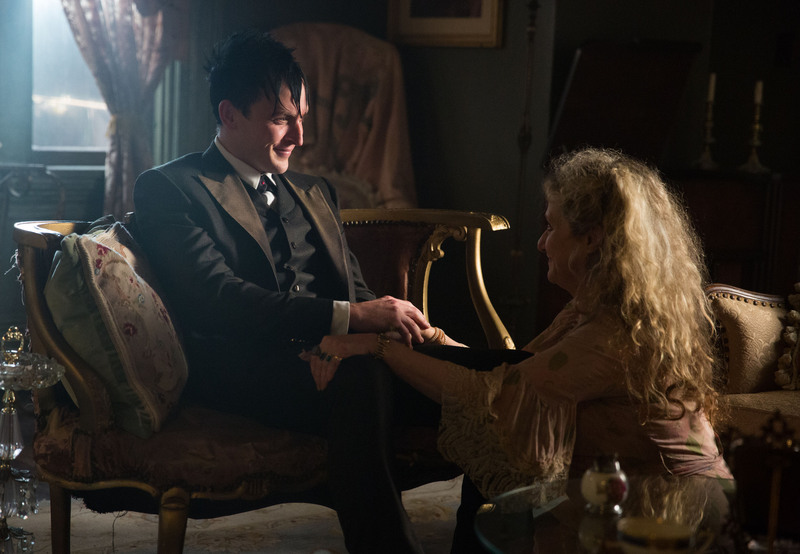 Didn’t see the point of this scene, I’m assuming something weird is going to happen with Cobblepot’s mother as the season plods along. Bullock doesn’t think it’s over. Barbara tells Gordon that Montoya has issued a warrant for his arrest. She begs him to run away with her and he says he can’t run. They slap the cuffs on him and takes him away. Bullock confronts a therapist who worked with the victims and the killers. Dr. Mars admits to hypnotizing people into believing they are The Goat to teach the citizens of Gotham that the Rich aren’t untouchable. Before Bullock can explain why he arrested a 1 percenter and his therapist, there’s a commotion in the squad room as Montoya brings in Gordon and then arrests Bullock. 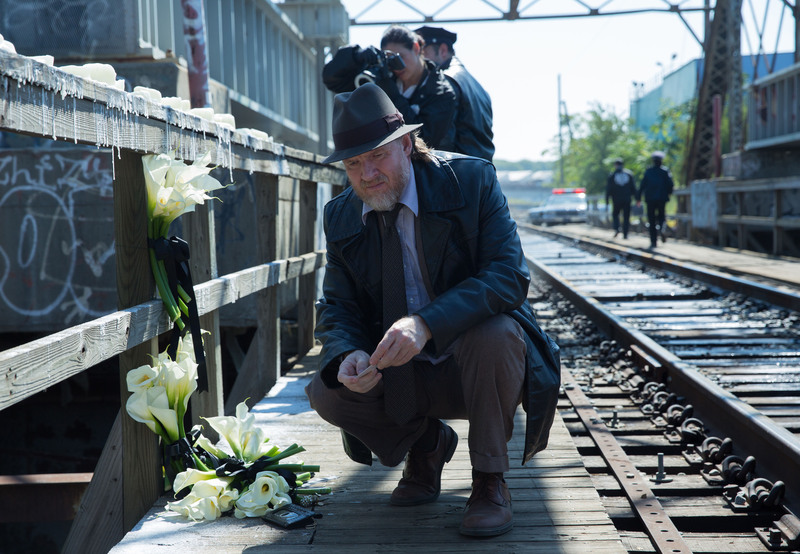 Gordon admits he didn’t shoot Cobblepot, while Bullock backs him up (still under the impression that he did), before a fight breaks out, everyone is shocked to see Cobblepot walk into the front door. I think this is the first episode that I really didn’t like. It was too jumpy and the episode was trying to do too much, while not doing much at all. The saving grace was we didn’t have any Fish this week. This was the 2nd time in 3 weeks where the villain’s motive was essentially “Eat the Rich,” I hope the writers don’t fall into a rut. It hard to be sympathetic with a so-called “vigilante” when they are brutally murdering the first born kids. I was thinking they were going to start working in The Court of Owls and was disappointed when it turned out to be the therapist. The ending was ridiculously chopped, we don’t find out what happened to Dr. Mars – one would assume there’s no way Bullock can prove she hypnotized all those people to be the Goat and Cobblepot’s appearance felt rush. They should have waited a week or two before he revealed himself. I love Cat and her brief 2 minute scene was a welcome breath of fresh air but completely pointless filler. I just don’t understand why they made the kids so young. Well I know they did it to hammer home the point this isn’t Batman, but why bother having them? They are too young to really be involved in much – although, Cat has strangely been around to witness everything. Previous PostNew Shows Go Four for Four as CBS Gives Out Full Season Orders!Next PostNBC’s The Mysteries of Laura Gets Full Season Order!